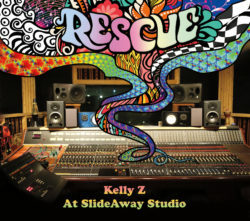 This album was originally begun in 2011, when singer Kelly Zirbes laid down – but didn’t finish – these eight tracks of classic-sounding 60s soul and funk for producer Chuck Kavooras in Los Angeles. When Chuck and Kelly began discussing a new project, they decided to finish off the tapes and this CD is the result. Kelly’s powerhouse soul shouting is obvious from the outset on Marva Whitney’s funk-filled ‘What Do I Have To Do’, though the tempo slows for a deep soul flavoured version of The Shirelles ‘Baby It’s You’, and even more so for the slow-burn of Mike Bloomfield’s 6/8/ soul ballad ‘You Don’t Realize’ (and it even has Barry Goldberg on organ). Ike & Tina’s ‘It’s Gonna Work Out Fine’ keeps the soul and humour of the 1961 original (nice Ikettes sound too from Teresa James, Shari Puorto and Lisa Orloff Staley). Ike & Tina’s 70s rock ‘n’ soul sound is evoked on the chugging ‘Trying To Find My Mind’, with excellent slide guitar work by Chuck himself, and Ella Washington’s/ Candi Staton’s cover of Harlan Howard’s country hit ‘He Called Me Baby’ is given a superlative treatment. Different in style but still worthy of that description is also Isaac Hayes’ slow but funky number ‘Do Your Thing’, before Kelly closes out this excellent soul set with ‘You Are My Sunshine’ - though Jimmy Davis might not recognise it as such, Aretha Franklin certainly would.